I’m sitting in the upstairs lounge of a very pleasant hosteria in El Calafate, Argentina (Cauquenes de Nimez, very highly recommended), looking out over Lago Argentina, on a sunny windswept day. The view could easily be exchanged with West Iceland, without anybody noticing, although it might confuse the sheep. 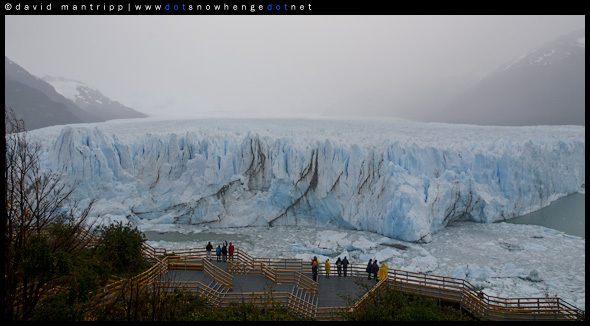 Yesterday we visited the world famous Perito Moreno glacier, and while it is very much touristified, it is done in a very tasteful and enjoyable way, with kilometers of walkways along the glacier front, and through the adjacent woods. So far from what I’ve seen of Argentina’s national parks, they are curated to a level on a par with Costa Rica’s, which is to say absolutely world class. Argentina is a fabulous, surprising, immense and welcoming country, and there’s enough to see and experience for a lifetime. So why is experiencing it not enough? Why do I persist in weighing myself down with crazy amounts of camera gear (even when it’s cut down to fit in a cabin-baggage friendly bag, it’s too much), and with the psychological stress of needing to “get the shot”? Yesterday I was briefy chatting with a fellw traveller who turned out to come from Ticino, about 5km from where we live, who was also described by his travelling partners as being a passionate photographer. Actually I’d noticed him before, as he was one of the few other people I could see carrying a tripod. Anyway, I flippantly remarked that it was more like an addiction than a passion. Later, and after an argument with my own travelling companion where the topic of being obsessed with photograhy again casme up, I thought maybe that this was a clear case of a true word spoken in jest. What, really, is the benefit of taking literally thousands of photograhs, of average quality at best, and more generally mundane to dull, and which nobody will ever see? Surely it is better to get away from this addiction on capturing views and getting back to experecing them. In the past, although I would take memento shots, and perhaps sometimes try something a little more ambitious, when I visited places, I would look for a quality book published by a local, where the photogaphy woukd far exceed what I can accomplish. Now, I have so much f**king gear that I can’t even fit a book into my 30kg baggage allowance. This has all gone very wrong. I think as soon as I get back most of my gear is going on eBay, and perhaps going on an extended, if not permanent, break from “serious” photography. After all, it’s really just a thinly veiled excuse for shopping.